I know what you're saying. Roma- what? Romanesco. Also known as Roman cauliflower. The name may not be familiar, but it's flavor profile will be. It tastes like a cross between broccoli and cauliflower, but a bit more delicate than either. ﻿It is the edible flower of the species Brassica oleracea. It is available only for a brief time of the year, between September and December. It is easily the most stunning vegetable I have ever seen. A whole head of romanesco looks like something out of an art museum. I blanched the romanesco and paired it with crunchy carrots, crisp cucumber, and bright red pepper for a healthy, refreshing, and beautiful salad. The dressing is inspired from a cucumber dish I love called Sunomono. The acidity from the rice vinegar and the sweetness from agave nectar pair beautifully with these veggies. Serve this salad as a side to any Asian cuisine or alone as a healthy, nutrient packed snack. Romanesco- a relative of broccoli and cauliflower, it subsequently contains most of the vitamins and minerals found in them. It has high levels of vitamin C, fiber, and potassium. It cooks up beautifully when steamed, just take care to not overcook it, as it can become mushy. Usually it will steam to al dente in 4-5 minutes. It is a marvel for the eyes, no doubt the most intricate and beautiful vegetable on the planet. Prepare the dressing by whisking the ingredients together in a non-reactive bowl. Taste and adjust the seasoning if necessary. Set aside. Blanch the romanesco in boiling water for 1-2 minutes. Immediately transfer to a bowl filled with ice and water to stop the cooking process. Drain well. 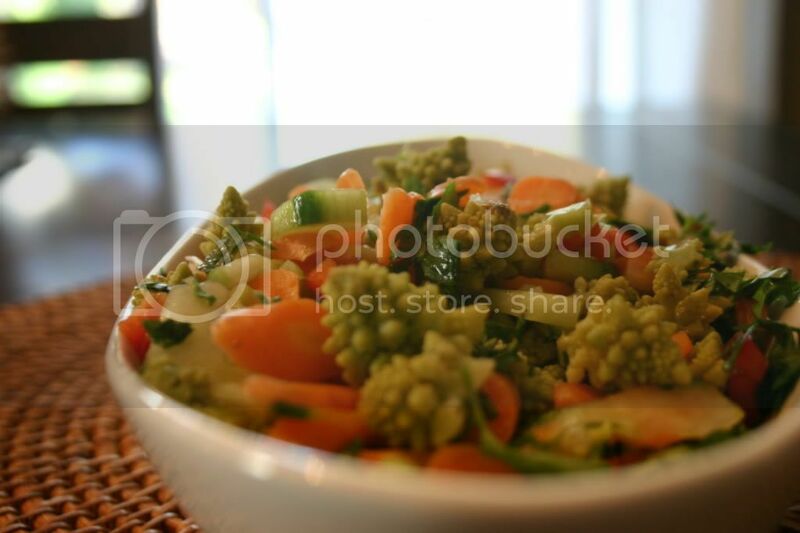 Put romanesco, carrots, cucumbers, onion, and bell pepper to a bowl and pour dressing over them. Toss well, making sure all the veggies get coated with the dressing. This salad is best if prepared several hours before you want to serve it, allowing the vegetables to marinate in the dressing. Stir in cilantro just before serving.